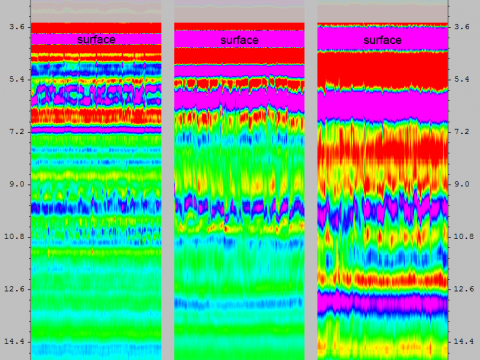 Penetradar Corporation specializes in the inspection of large and complex bridge decks with our patented ground penetrating radar (GPR) four antenna array which allows simultaneous collection of radar data across a twelve foot lane in one pass. 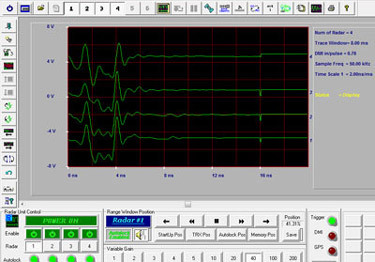 Four channels of radar data are collected with the same distance referencing eliminating inconsistencies in distance correlation between radar passes which are a problem associated with single and dual channel systems that must make multiple passes to cover a lane. 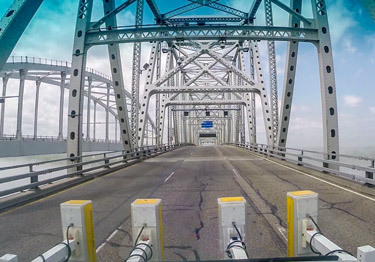 With our system, we can scan large and complex bridge decks efficiently and economically in just a short time with a single pass over each lane collecting data at highway speeds, thereby eliminating traffic congestion, road closures and safety concerns. 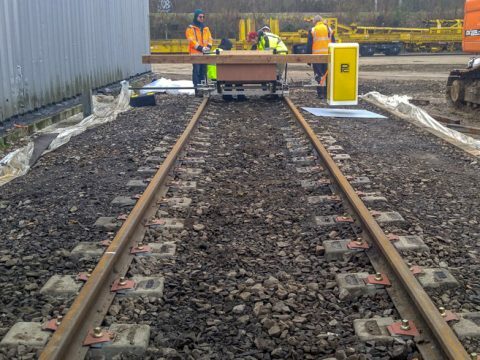 Penetradar’s Ground Penetrating Radar has become the technology of choice by transportation agencies across North America as evidenced by the representative projects shown below. All the bridge decks shown were inspected in only a few hours at highway speeds and without any traffic disruption. The Walt Whitman Bridge is one of the largest bridges on the east coast at almost 12,000 feet in length and carries seven lanes of Interstate 76 over the Delaware River between Philadelphia, PA and Gloucester City, NJ with a daily traffic volume over 100,000 vehicles. 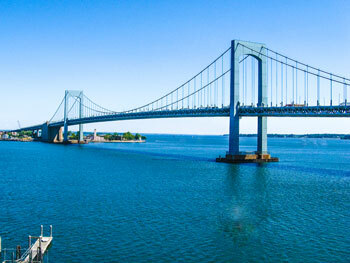 The Throgs Neck Bridge in New York City is over 12,000 feet in length and carries six lanes of Interstate 295 over the East River connecting the Bronx and Queens. 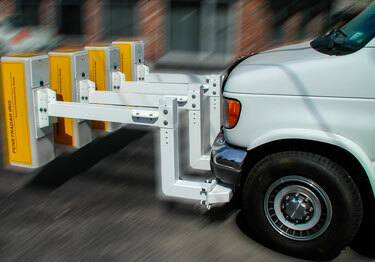 Over 100,000 vehicles cross the bridge daily. 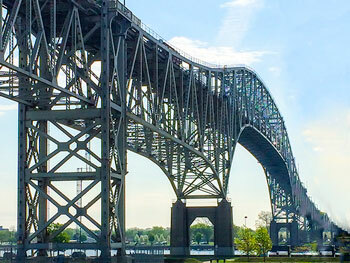 The Commodore Barry Bridge carries US 322 across the Delaware River from Chester, Pennsylvania to Bridgeport, New Jersey and was opened in 1974. The bridge carries five lanes of traffic with a daily traffic flow of 35,000 vehicles. 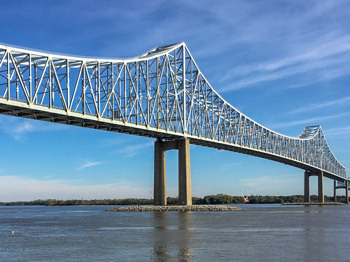 The Betsy Ross Bridge is over 8,000 feet in length and carries six lanes of eastbound and westbound Route 90 traffic across the Delaware River between Philadelphia, PA and Pennsauken, NJ. The average daily traffic volume is almost 40,000 vehicles. The Champlain Bridge in Montreal, Quebec, Canada is over 11,000 feet in length and carries six lanes of Autoroute 10 crossing the St. Lawrence River. 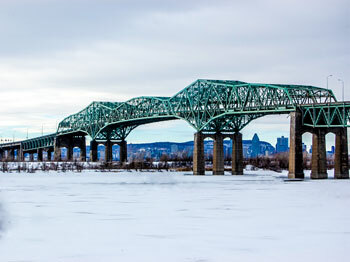 With roughly sixty million vehicles cross the bridge annually, The Champlain Bridge is the busiest bridge in Canada. 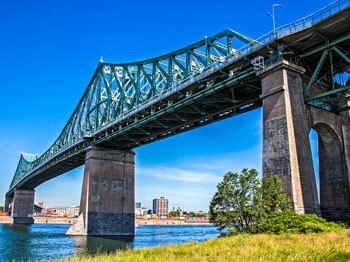 The Jacques Cartier Bridge in Montreal, Quebec, Canada is just under 9,000 feet in length and crosses the St. Lawrence River carrying five lanes of Route 134. With a traffic volume of 100,000 vehicles a day the bridge is the third busiest in Canada. 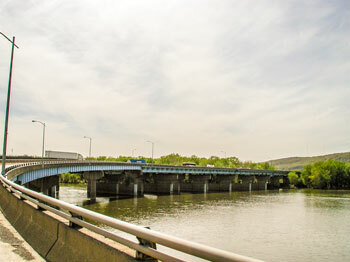 The George N. Wade Memorial Bridge is 5,188 feet in length and carries six lanes and multiple ramps of Interstate 81 and the Capital Beltway over the Susquehanna River. 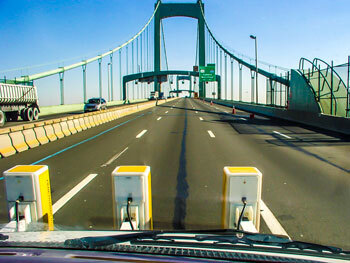 Nearly 64,000 vehicles cross the bridge daily. 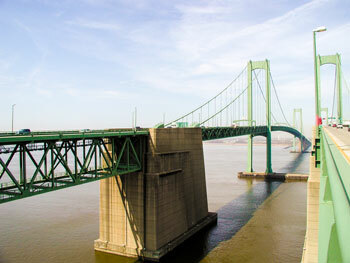 The Delaware Memorial Bridge is made up of two suspension bridges that carry eight lanes of Interstate 295 over the Delaware River connecting New Jersey and Delaware. 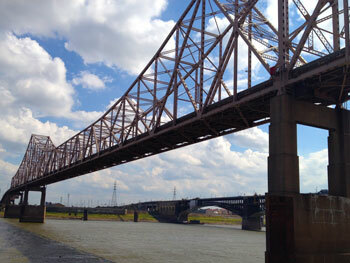 The bridge is over 10,000 feet in length and more than 50,000 vehicles cross the bridge daily. The Blue Water Bridge is 6,150 feet in length and carries six lanes of Interstate 94 over the St. Clair River. The bridge connects Port Huron, Michigan and Point Edward, Ontario. This international crossing has a daily traffic volume of 14,000 vehicles. The Claiborne Pell Newport Bridge is over 11,000 feet in length and carries four lanes of Route 138 across the Narragansett Bay. The bridge connects the city of Newport and the town of Jamestown in Rhode Island with a daily traffic volume of 27,000. 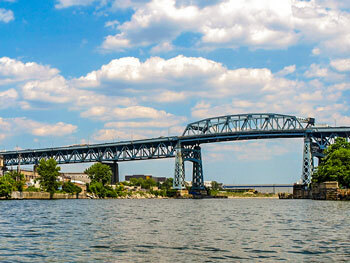 The Kosciuszko Bridge is just over 6,000 feet in length and carries Interstate 278 over Newton Creek. This bridge connects Queens and Brooklyn in New York City. 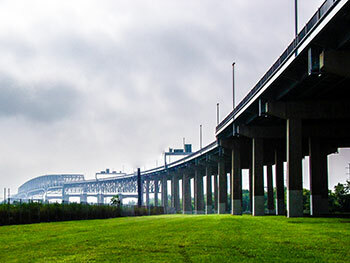 The Kosciuszko Bridge has a daily traffic volume of over 190,000 vehicles. 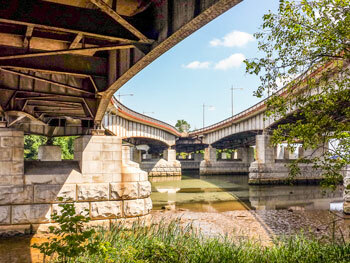 The Theodore Roosevelt Bridge is over 3,000 feet in length and carries six lanes of Interstate 66 over the Potomac River. The bridge connects Washington D.C. and Rosslyn, VA with a daily traffic volume of 100,000 vehicles. The Poplar Street Bridge is 2,100 feet in length and carries eight lanes of Interstate 55 over the Mississippi River connecting St. Louis, Missouri and East St. Louis, Illinois. 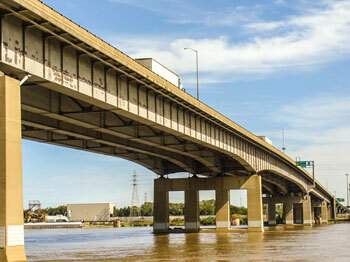 With over 100,000 vehicles crossing daily, the bridge is the second busiest over the Mississippi River. The Martin Luther King Bridge is 4,000 feet in length and carries three lanes of Route 799 over the Mississippi River connecting St. Louis, Missouri and East St. Louis, Illinois. The bridge has a daily traffic volume of 12,700 vehicles.